Take a pan, add coriander seeds, chana dal, tur dal, pepper corn and red chillies. Roast it for 2 minutes. Add the coconut and asafoetida. Roast it for a minute. Let it cool. Add the ingredients in to a grinder and grind it in to a powder. Take a pot. 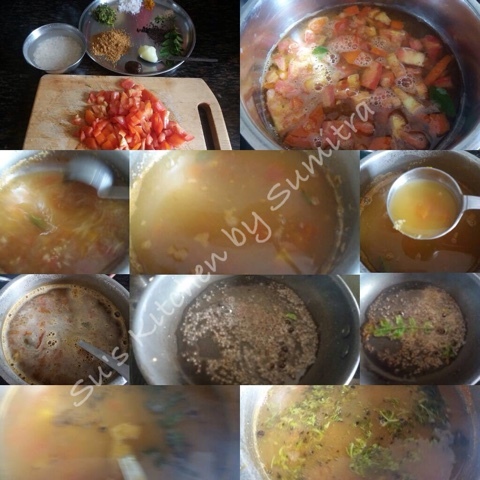 Add 3 cups of water, tamarind paste, tomatoes, few curry leaves, turmeric powder and salt. Put the pot on simmer for 10 to 15 minutes. Add the soaked oat along with 3 cups of water. Let it simmer. 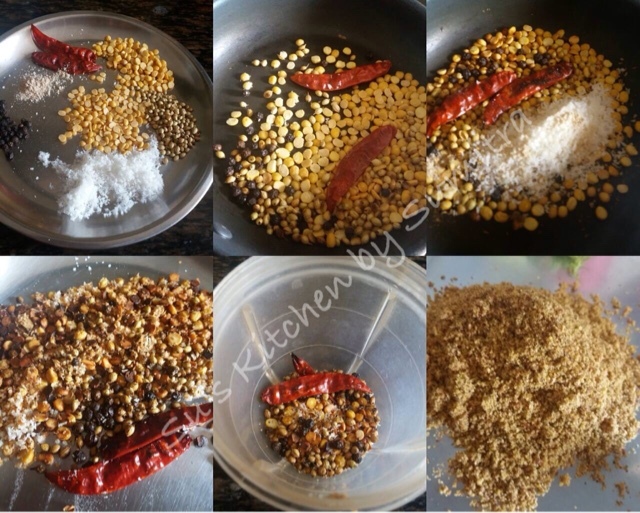 Add the rasam powder. Let it simmer for 5 minutes. Take another pan. Add ghee. Add mustard seeds, let it crackle. Add curry leaves and asafoetida. Sauté for few seconds. 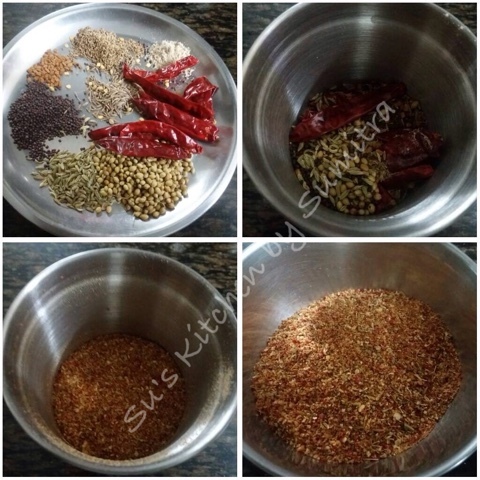 Add the seasoning to the rasam. Switch off the flame. Garnish it with coriander leaves. Serve it hot. Add 1 cup oats, soaked urid dal, salt and water as required in a grinder. Grind it into a coarse batter. While grinding don't add too much of water. Take is out from the grinder and add remaining oats, cumin seeds, pepper, chilli and water as required. Mix it well. Take oil in a wok. Let it heat. Take a tbsp of the batter and drop it into the oil. Fry it till golden brown. 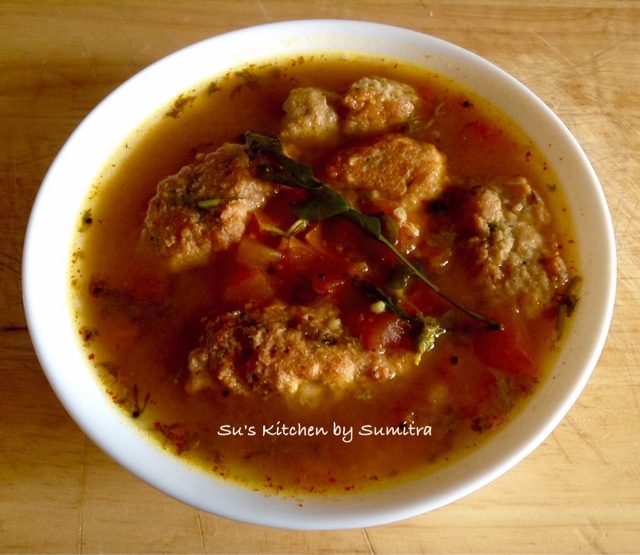 Serve the vadas with hot rasam. 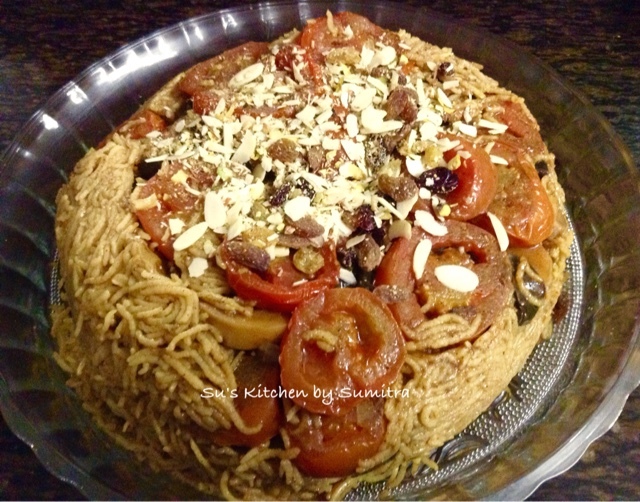 While net searching, This Pakistani dish attracted my attention for it's beautiful name. 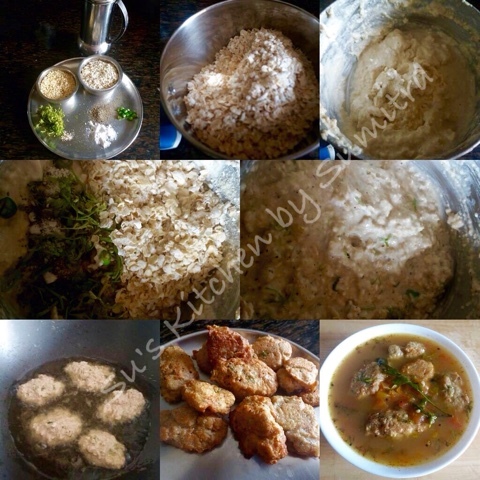 It's a very tasty and easy mutton recipe. 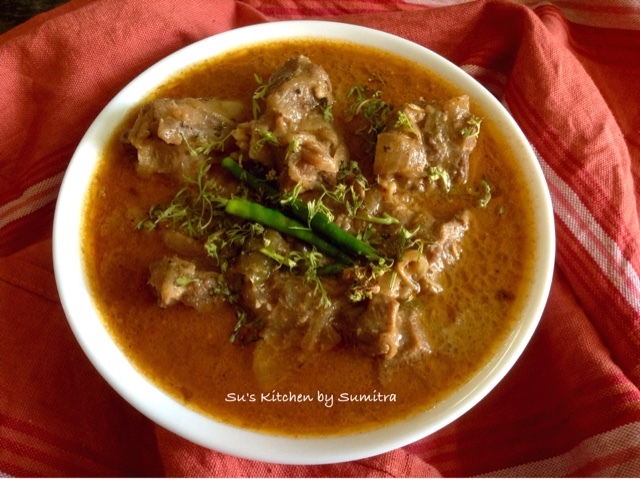 The mutton is cooked in curd base sauce with cashew paste, saffron and spices. A must try recipe. Take a pressure cooker, add 1 tbsp oil or ghee. Heat it. Add mutton, salt, ginger and garlic paste. Sauté it for 3 minutes. Add 2 cups of water. Stir it. Cover and pressure cook it till 4 whistles. Take a pan, heat the remaining ghee or oil. Let it heat. Fry the onions and 2 green Chillies till the onions are brown in colour. Take curd, add cashew paste, chilli powder, saffron and garam masala powder. Mix it well. Pour the curd into the pan. Stir and cook on low flame for 5 to 10 minutes till the oil releases from the curd. Add the boiled mutton along with the broth. Check the salt, add if required. Stir it. Cover and cook for 15 minutes. 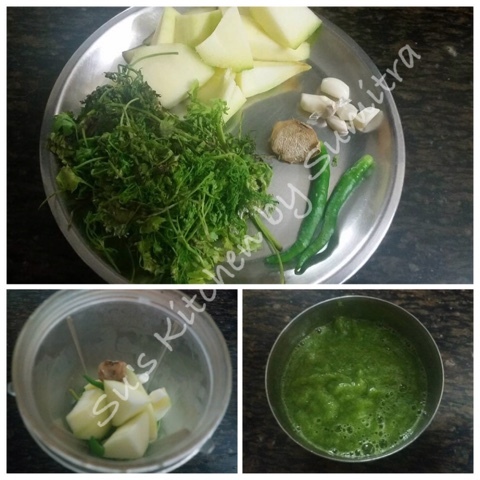 Garnish with coriander leaves and remaining green chilli. 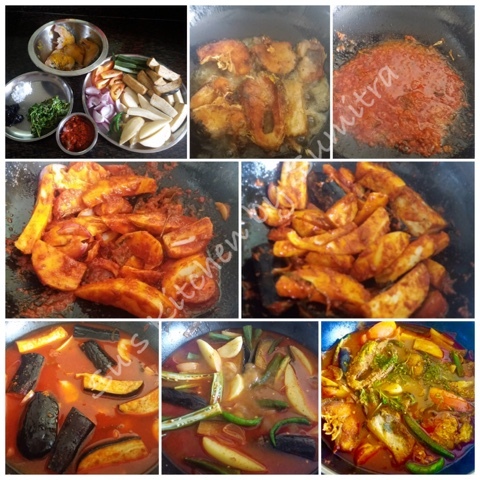 It is an Indonesian, Malay curry dish. 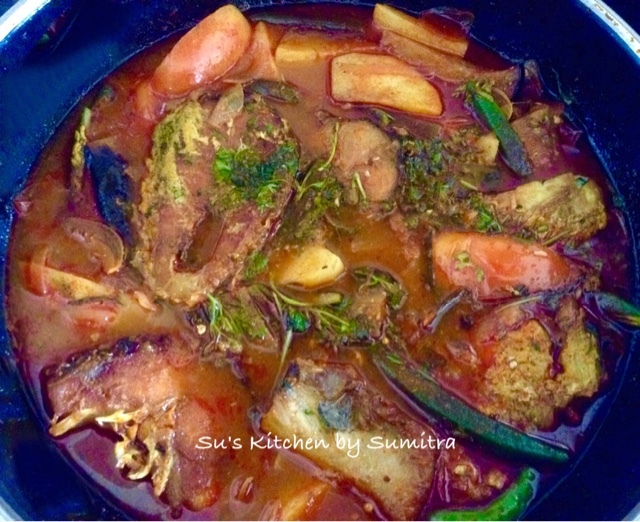 Vegetables like okra, brinjal, potato and tomato are added in the dish along with the fish. Fish like mackerel, sting ray, prawns or sweet water fish can be used. Grind all the above ingredients into a fine paste. 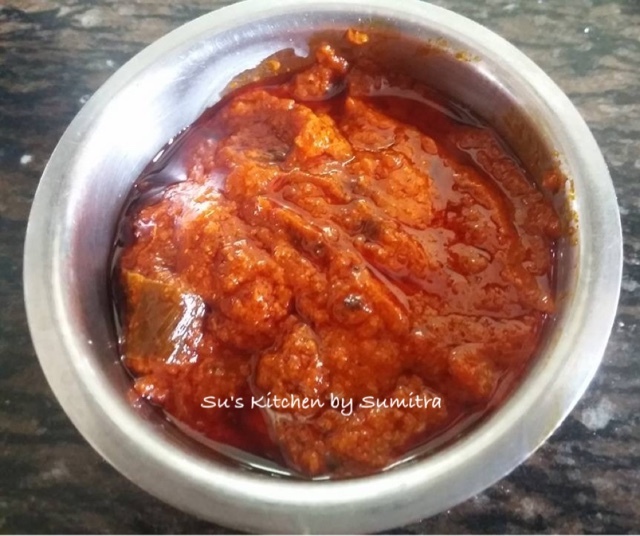 6 pieces Rohu Fish marinated with 1/2 tsp Turmeric powder and salt. Heat the oil in a wok. Fry the fish until brown. Remove it and keep it aside. Remove the excess oil from the wok and let 2 tbsp of oil remain. Add the paste, saute it for 2 minutes. Add the potato, onion and brinjal. Stir it. Add water and cook it till the vegetables are almost done. Add the tamarind paste, okras and green chillies. Let it simmer for 2 minutes. Add tomatoes, salt and the fish pieces. Lastly, put in the fried fish and coriander leaves. Let it simmer for 2 minutes. Serve it with hot steam rice. This an experiment in my kitchen. Mango the king of fruits... can be made in any ways... 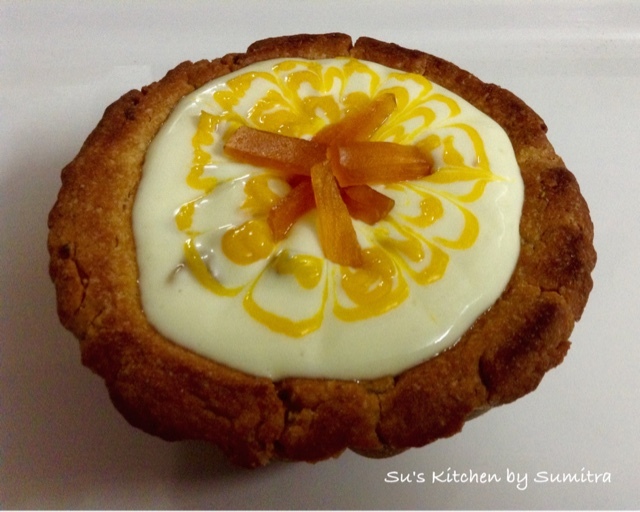 In this dessert, the base is a mango and oats cookie and is fillied with cream of mango... 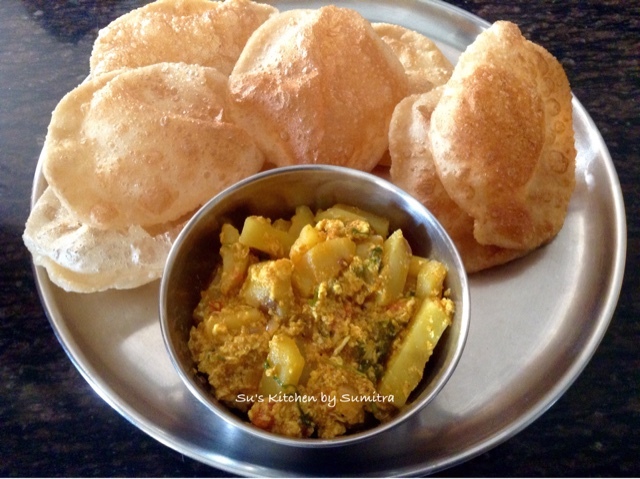 I have used ripped dried mango to give this dish a tangy and sweet taste. Do try out... I am sure you will like it. In a bowl take butter and sugar and beat it well until smooth. Keep it aside. In another bowl mix whole wheat flour, oats powder and baking powder. Mix the flours and 1 tbsp chopped aam papad in to the butter mixture, slowly start stir mixing it. Add the mango puree and form a dough. Let this sit for 20 minutes covered. Preheat the oven to 190 degrees celcius. Roll the dough into thick sheet and placed the roll dough in a greased bowl, giving it a shape of a bowl. Bake at 190 degrees celcius for 15 to 20 minutes. Take it out of the oven and cool it on a wire rack. Unmould it. Place the cookie bowl on a plate upside down. Bake it again for 5 minutes, turn and bake again for 5 minutes. Take it out and cool it completely before garnishing. Garnish the cookie bowl just before serving. Beat the cream with the sugar. Add the Aam papad. Mix it. 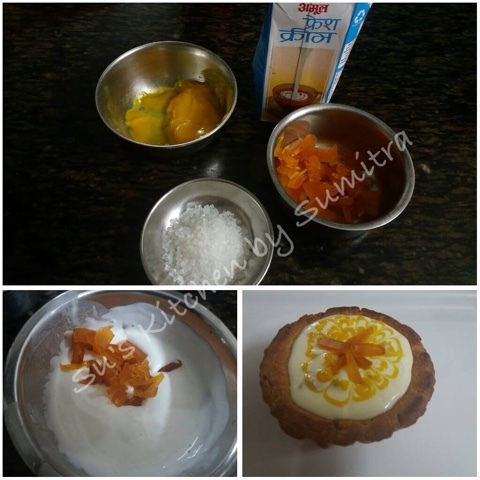 Pour the cream in the cookie bowl, garnish with mango puree and few pieces of Aam papad. Add the roasted oats, rice and 4 tbsp water in a grinder and grind it into a paste. Take a pot, add milk. Simmer the milk for 5 minutes. Add sugar, salt and cardomom powder, let the sugar dissolve. Add the oats and rice paste and keep stirring it on low flame continuously, till the milk thickens. Take it off the flame and keep stirring till a bit cool. Add the mango puree and mix it well. 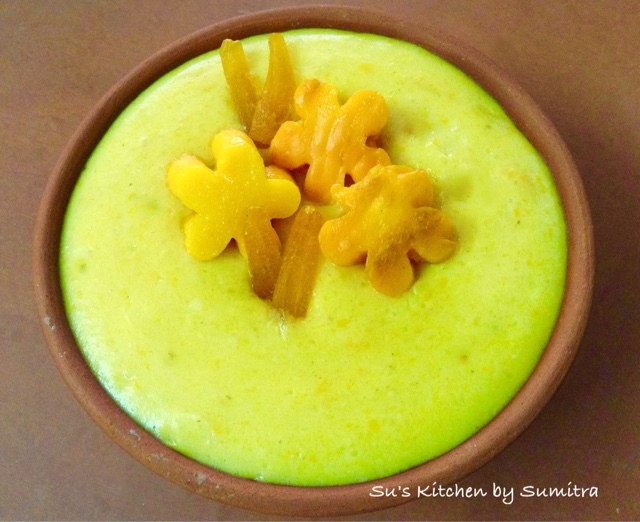 Take small mithi bowls, add the oats mango phirni in the bowls. Garnish it with mango pieces. Cool it in the fridge till served. Grind all the above ingredients in a grinder in to a paste. Take oil in a wok. Heat the oil up. Add the okras and stir fry for 2 minutes. Remove it and keep it aside. Add the paste and sauté it for 2 minutes. Add the salt, turmeric powder and curry powder. Stir it for 2 minutes. Add the vegetables except okras. Stir fry for 2 minutes. Add 2 cups of water. Cover and cook it till the vegetables are done. Add the prawns and the okras cook it for 2 to 3 minutes. Serve hot with steamed rice. At times when we are lazy to cook, that is the time this pickle comes handy with simple hot dal, rice and papads or fish fry. This dish is an experiment in my kitchen. Try it out and I am sure you will love it. 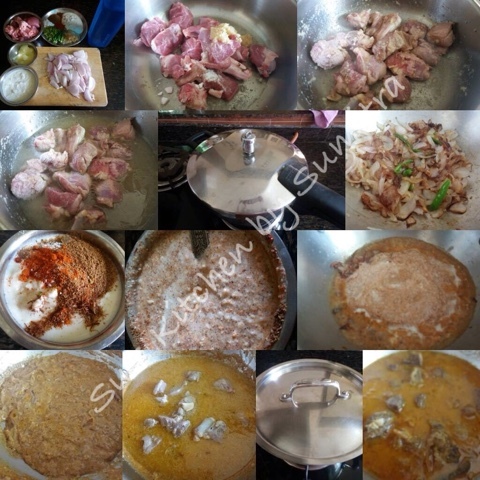 Mix all the above ingredients and marinate it for 6 hours. Grind all the above ingredients into a fine powder and keep this aside. Add oil to a wok. 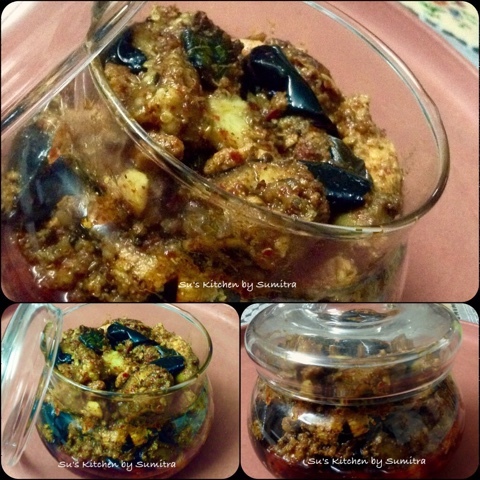 When the oil is hot, add the brinjals and fry it. Remove it and keep it aside. 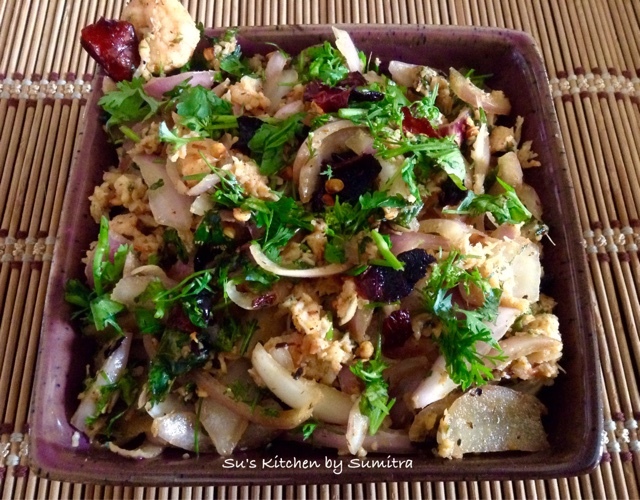 In the same oil, add the mustard seeds, coriander seeds, fenugreek seeds and fennel seeds. Let it crackle. Add the curry leaves and garlic. Sauté it for 2 minutes. Add the marinated chicken. Cook it for 10 minutes or till done. 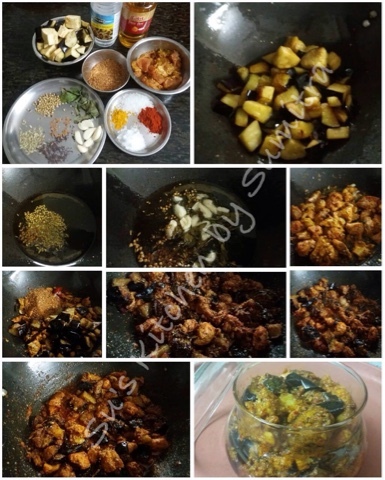 Add the brinjals, the spice powder, turmeric powder, chilli powder and sugar. Stir it. Cook it for 5 minutes. Add the vinegar and salt. Stir and cook for 1 minute. Remove from the fire and let it cool. Keep it in a glass container and store in the refrigerator. It stays for 6 month. It's too hot today to go into the kitchen and make breakfast. I thought in my mine. While in my thoughts, my husband opted to make the breakfast and give me a break from making the breakfast.... oh.. wow... what can I ask for more... 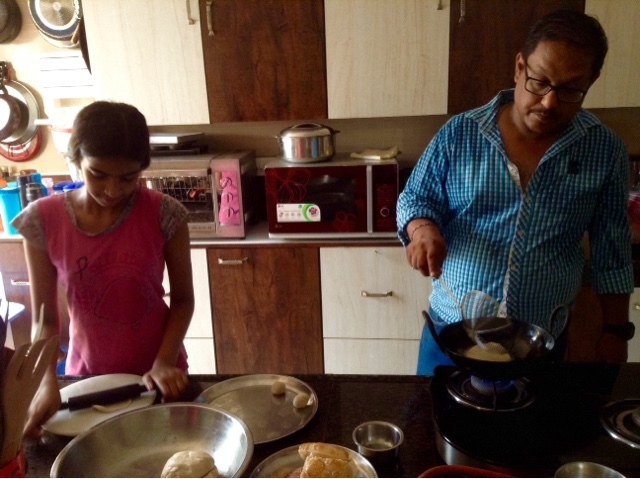 It's a morning bliss, when husband and daughter made Dim Aloor Chochori and Luchi, while I enjoy eating it. Take a wok, heat the oil. 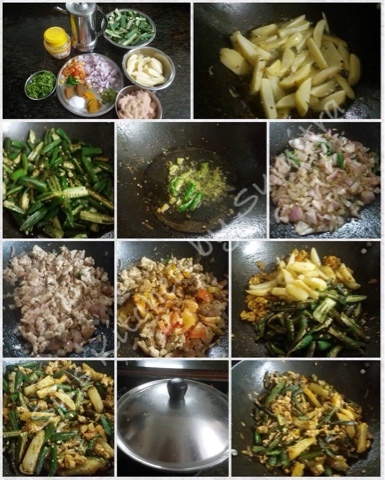 Add the onion and green chillies, fry till light brown in colour. Add the ginger, sauté for 2 minutes, add the potatoes, stir fry for 2 minutes, add the turmeric, chilli, garam masala and coriander - cumin powder. Stir for another 3 minutes. Add the tomato and salt, stir for 1 minute. Add 1 1/4 cup water, simmer on low heat till the potatoes are done. Add the beaten egg and cook it till semi dry. Garnish it with coriander leaves. Thokku is in between vegetable dish and a pickle. It is made in South Indian homes. In thokku water content is reduced and it can be kept for longer period. 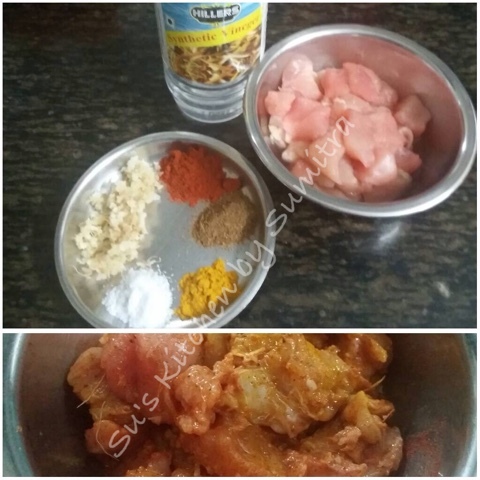 Thokku can be kept in the refrigerator for 2 months in a clean dry glass bottle. 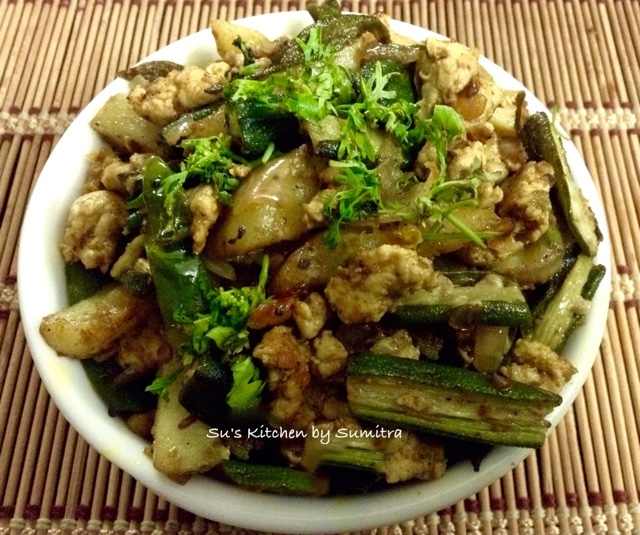 Thokku can be made with other veggies too. It can be eaten as a dip, spread, or as pickle. 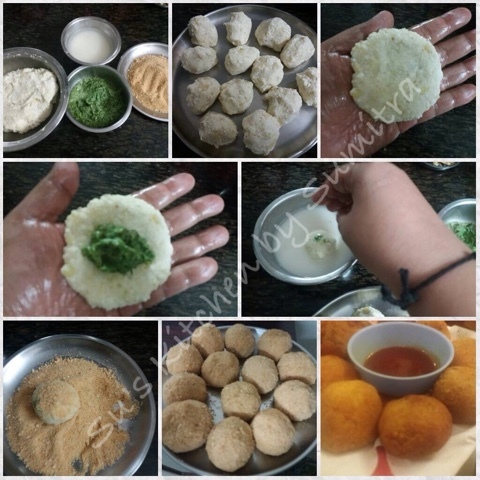 You can eat it with Bread, dosa, chapati and curd rice or eat it mixed with steamed rice. Heat the 1 tbsp oil and add the mangoes, green chillies and coriander leaves. Stir fry till all the water dries up. Remove from the heat and let it cool. 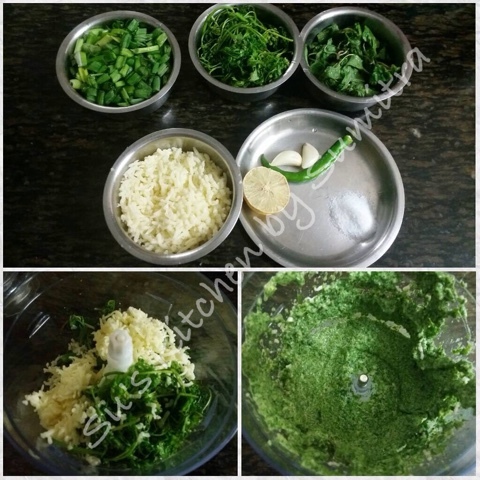 Put the mangoes, green chillies and coriander leaves into a grinder. Grind the ingredients into a smooth paste. Heat the remaining oil in a wok. Add the urid and chana dal. Sauté it for 2 minutes. Add the mustard seeds and fenugreek seed. Let it crackle. Add the curry leaves and asafoetida. Sauté it for few seconds. 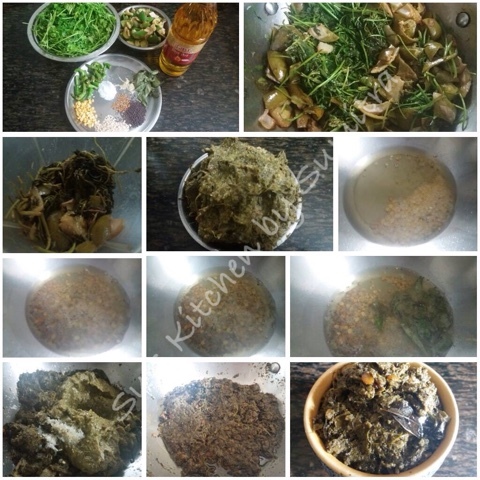 Add the paste and salt, cook it for 10 to 15 minutes on low flame, stirring it occasionally, till the oil releases from the paste. Remove it from the flame and let it cool. It can be stored in a clean and dry glass bottle for 2 months in the fridge. 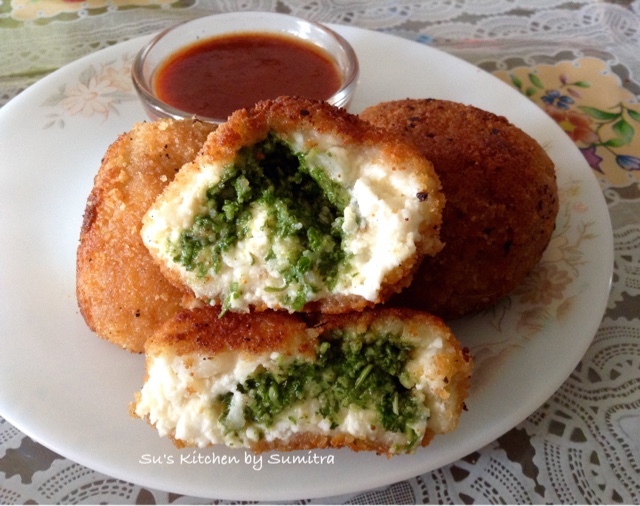 Serve this with sandwich, dosa, chapati or curd rice. 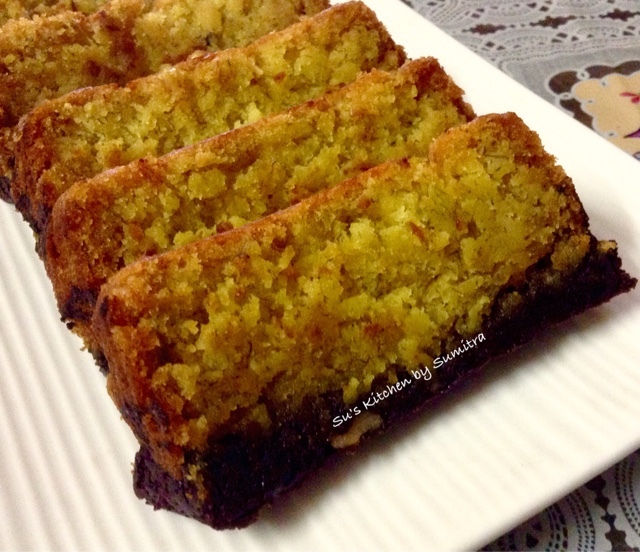 I love the flavour of the coconut and the tangy sweet taste of the mango in this recipe. 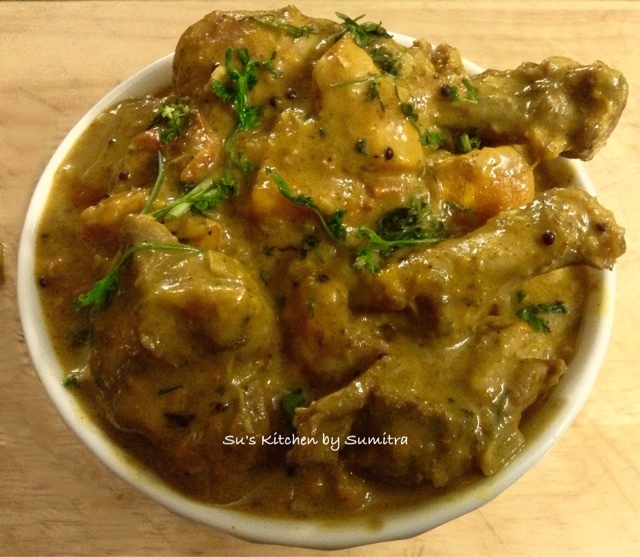 It has the rich creamy texture due to the coconut milk added to the dish. 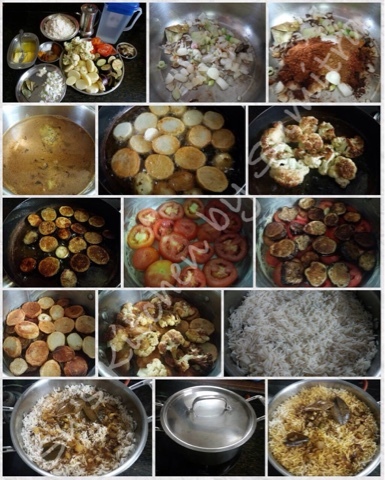 This dish can be eaten with rice, Chappati or paratha..
Take a wok, add oil. Let it heat. Add the mustard seeds and curry leaves. Let the mustard seeds crackle. Add the onions. Sauté it till it is light brown in colour. Add the green chillies, garlic and ginger paste. Sauté it for 2 minutes. Add the chicken. Stir it, cover and cook for 15 minutes, stirring it occasionally. Add the tomatoes, curry powder, salt and turmeric powder. Stir it and cook for 5 minutes. Add the coconut milk. Cover and cook for 5 minutes more. Add the chopped mango. Stir it. Cook for 2 minutes. Switch off the flame. Garnish it with coriander leaves. 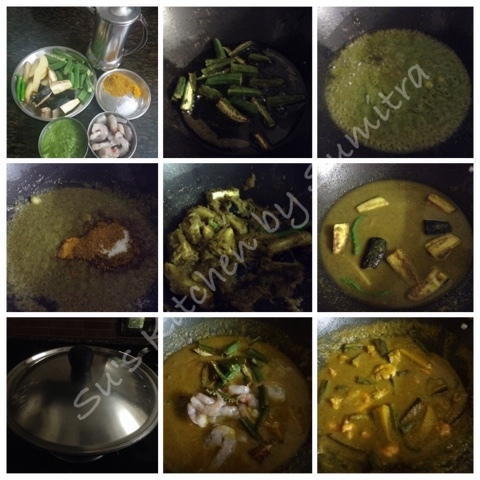 Take a pan, add all the spices except for the curry leaves, turmeric powder and nutmeg powder. Roast the spices for a minute. Remove it and keep aside. Roast the curry leaves. Let the spices cool down. Add the turmeric powder, nutmeg powder and all the other ingredients in the grinder, and grind it into a fine powder. Store it in a dry and clean bottle. This is a very popular Bangladeshi dish. 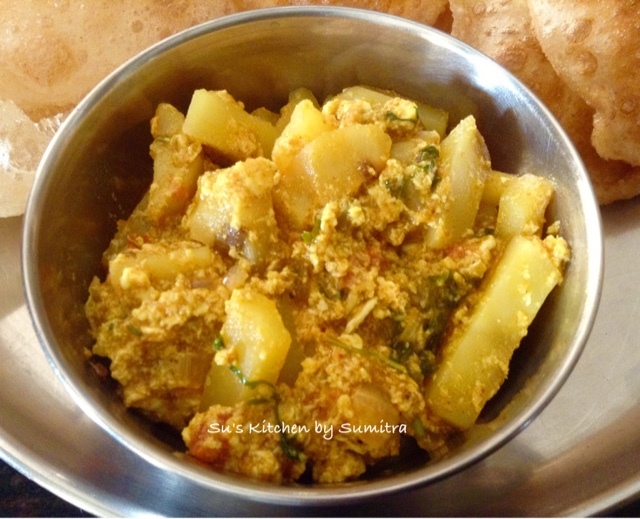 It is spicy mashed prawns dish flavoured with garlic, ginger, fried dry chillies and mustard oil. It is eaten with steamed hot rice. 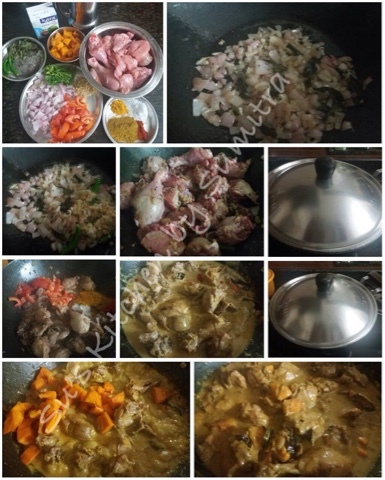 You can actually finish all the rice with this dish..
Take a pan, add 1 tbsp oil. Heat it till smoking hot. Lower the flame, fry the red chillies till brown in colour, remove and keep it aside. In the same pan, add the garlic and ginger. Sauté it for 2 minutes. Add the prawns and sauté it till it is cooked. Remove it from the pan and cool it. Add it into the grinder and roughly grind it... some pieces of the prawns should be seen or the prawns can be chopped into small pieces. Take a mixing bowl, crush 2 chillies and add it in the bowl. Add the onions, coriander leaves, salt and mustard oil. Mix it well. Add the prawns and mix again. Garnish with some more coriander leaves and the remaining chilli. Serve it with hot steaming rice. 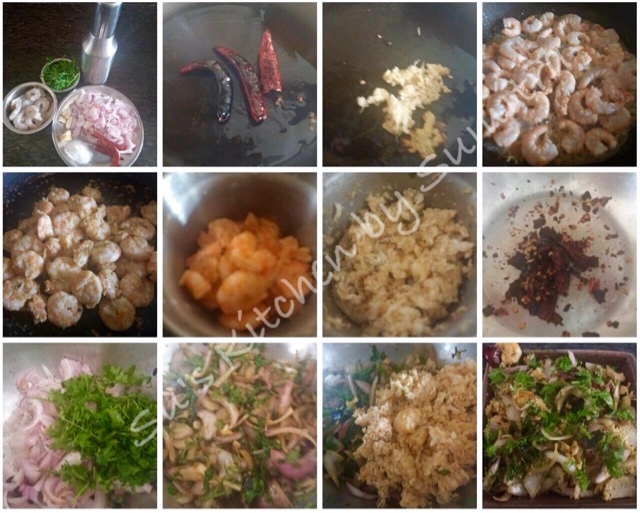 P. S. Instead of sautéing the prawns, boiled prawns can be also used. 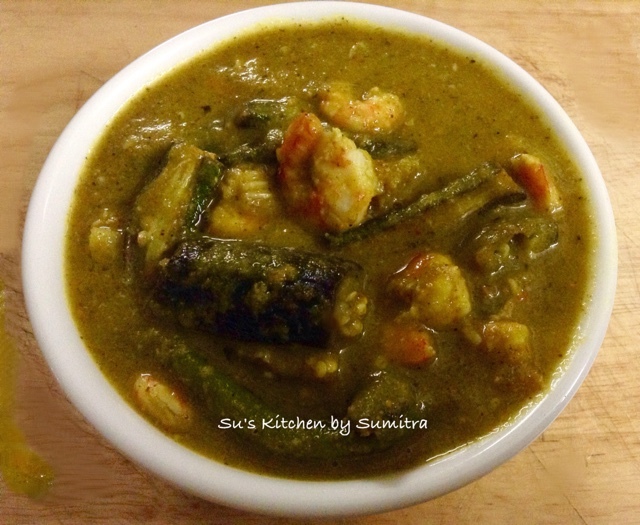 Fresh green chillies can also be used instead of dry red chillies. Prepare the loaf tin with greasing and laying the parchment paper and again greasing it with oil. Melt the chocolate and butter on low heat. Remove and leave to cool slightly. Stir in brown sugar until mix it well. 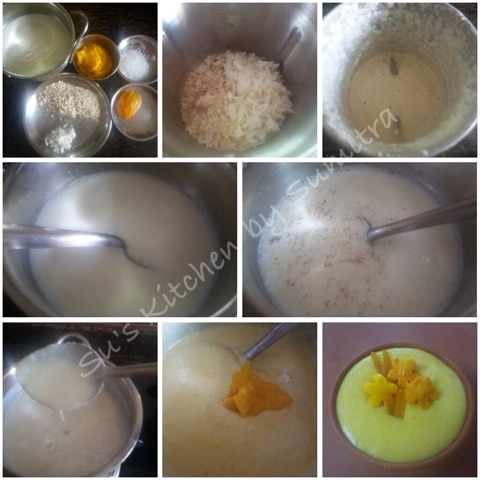 Add in curd, mix well. 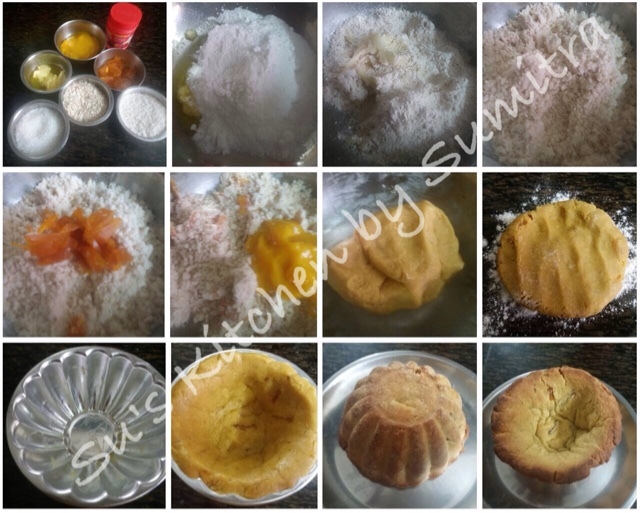 Fold in flour, soda bicarbonate and baking powder, mix until well combined. Add the walnuts and fold the batter. Pour the batter into the prepared loaf pan. Bake it in preheated oven for 20 minutes at 180 degrees celcius. 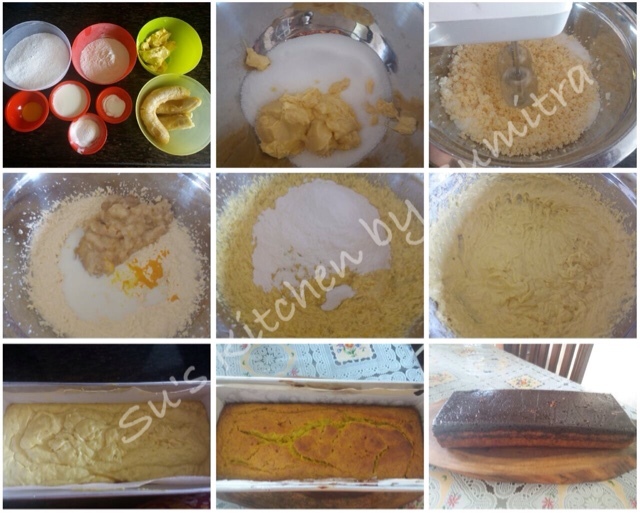 Meanwhile when the brownie is baking, prepare the batter for the banana cake. 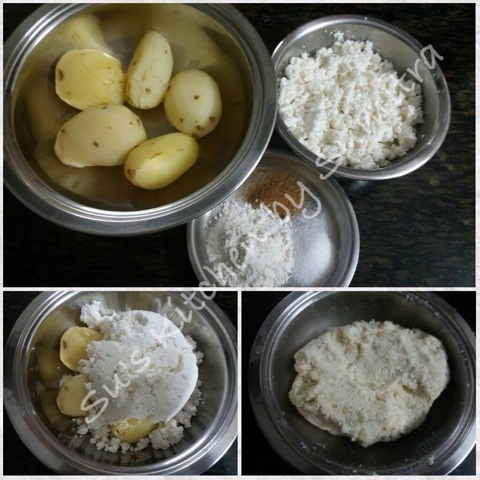 This Bengali sweet is creamy and soft. It is made with #SugarFree, cottage cheese and mango pulp as the key ingredients used in it. Take a pan and add milk in it, simmer the milk and reduce it to a cup, stirring it occasionally. 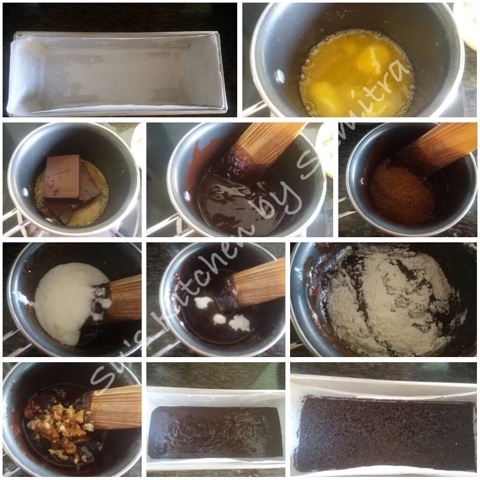 Add Sugarfree and stir it until it dissolves. Let it cool down. Add the cream, mango pulp and cardomom powder. Mix it well. keep it aside. 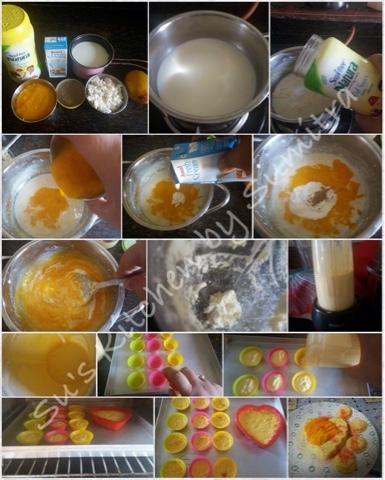 Blend the cottage cheese in a blender till light and fluffy. Add the creamy mixture and blend it again. Take a silicone mould, grease it with ghee. Add the mixture into the mould. 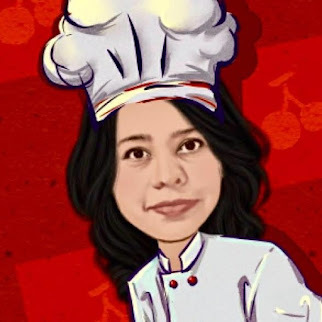 Bake it for 10 to 15 minutes at 180 degrees celcius in a preheated oven. Once it is set, take it out and refrigerate it for 30 minutes. 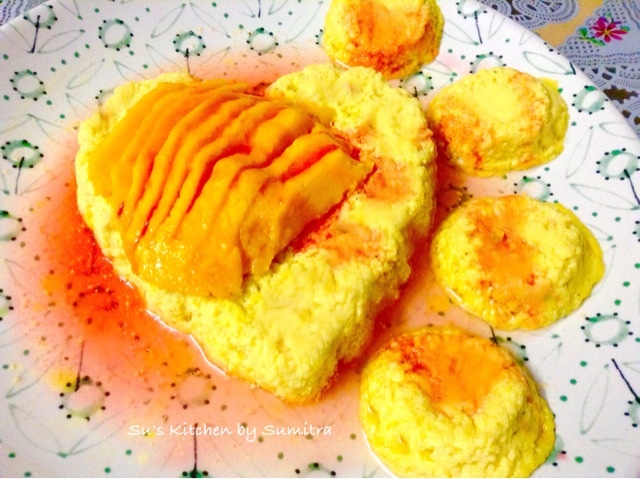 Garnish it with chopped mangoes and drizzle it with Rose syrup. Serve it cold. Take a wok, add oil and heat it. Add the garlic minced in the wok. 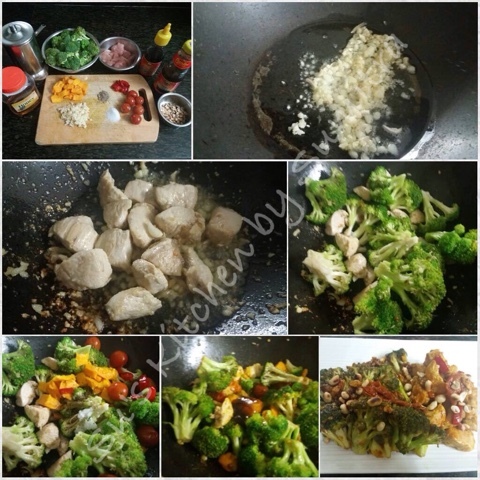 Stir fry it till light brown on a medium heat, Add the chicken, continue to stir fry for 5 minutes. Add the broccoli florets. Stir fry for 5 minutes. Add the red chilli slices, mango pieces, cherry tomatoes, salt and pepper powder. Stir fry for 5 minutes more. Add the oyster sauce, fish sauce and honey. 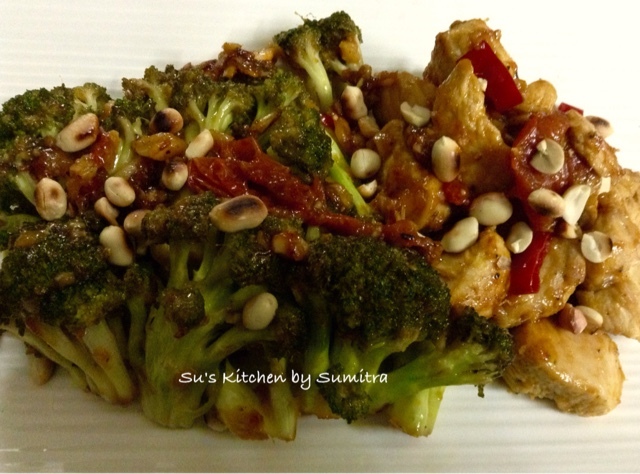 Continue to cook till the broccoli and chicken are tender. In between sprinkle little water while stirring otherwise the sauce may get burnt and broccoli will not cook. Garnish with roasted peanuts and serve it hot. 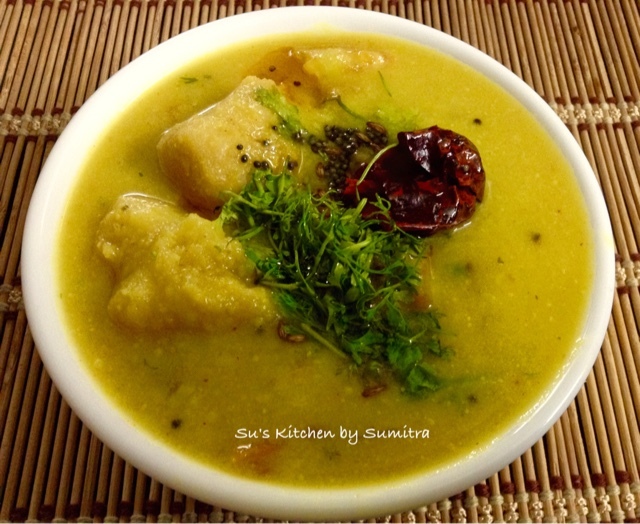 This dish is made in the Kumaon region of Himachal. 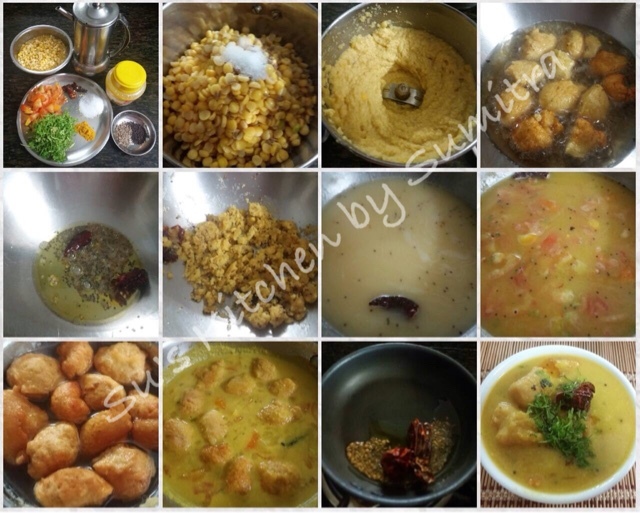 It is a very simple to make using Yellow pigeon peas made into paste and made into pakoras using 1/2 the paste and the rest of the remaining paste is used to make the gravy. The type of lentils can vary. 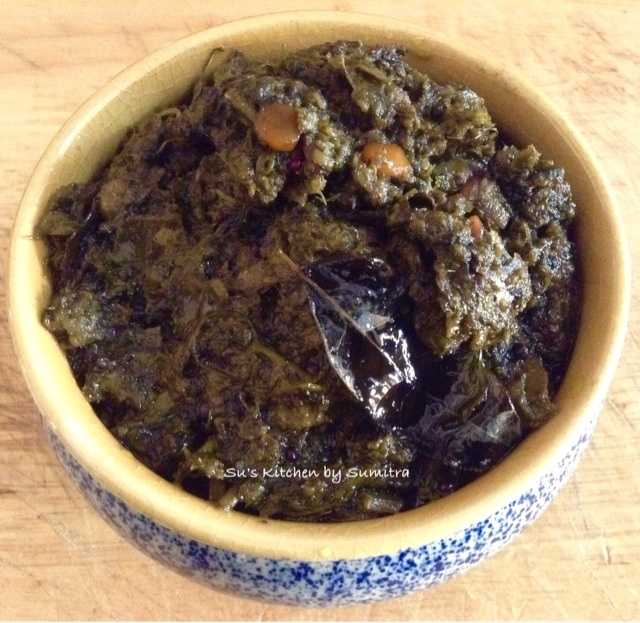 Green grams or Red lentils can be used. Add the dal, 1/4 tsp cumin seeds and salt in a grinder and make it into a paste. To make the pakoras, take 1/2 the dal paste. Heat oil in a wok. Add the 1/2 tsp dal paste in oil and make small pakoras. Keep it aside. To make the dubke, heat oil in a wok. Add the remaining cumin seeds, mustard seeds and red chilli. Let it crackle. Add the remaining dal paste. Stir fry it continuously for 2 minutes. Add 4 cups of water little at a time, stirring it continuously. Add salt, turmeric powder and tomato. Boil and then simmer the dal on low flame for 20 minutes, stirring occasionally. Mean while soak the pakoras in water. After 20 minutes add the pakoras and simmer for few minutes. For the final seasoning take a pan, add the ghee. Let it heat. Add the chill, cumin seeds and mustard seeds. Let it crackle. Add the seasoning from top. Heat 1 tablespoon of oil in a pot, add bay leaves, onions and garlic, stir for 2 minutes. Add salt, pepper, turmeric powder, cumin powder, allspices powder and baharat powder. Add 4 1/2 cups vegetable stock and let simmer for 10 minutes. Keep it aside. Take another pan, heat the oil for frying. Add the eggplant slices and fry it from both sides until golden brown. Take it out and on an absorbent paper, keep it aside. Fry the cauliflower florets and keep it aside. Fry the potatoes and keep it aside. Take a heavy bottom pot. Grease it with butter. Arrange the tomato, eggplant, potatoes and cauliflower in layers. Pour 1/2 the stock, add the rice and then pour the remaining stock. Cover it and cook it on a low flame. Till the rice is cooked. Let it cool a bit, then carefully flip it up-side down on a serving platter. Garnish it with raisins, berries, almond and pistachio flakes. Serve hot with fresh yogurt or Arabic salad. 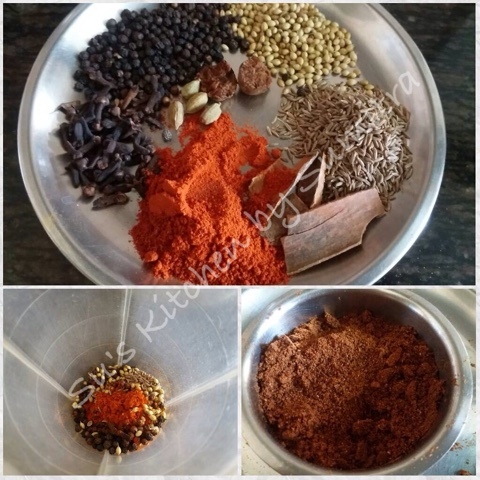 Blend all the above spices in a blender. Store it in a dry glass container. 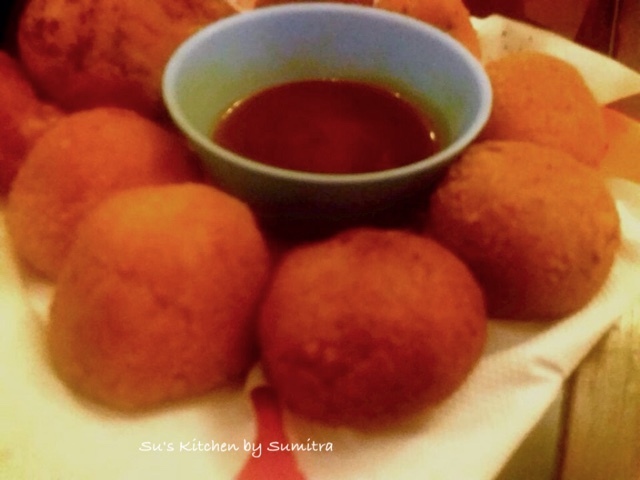 This dish can be served as an appetiser. Add all the above ingredients in a grinder and grind it. Mix and knead all the above ingredients together to form a dough.